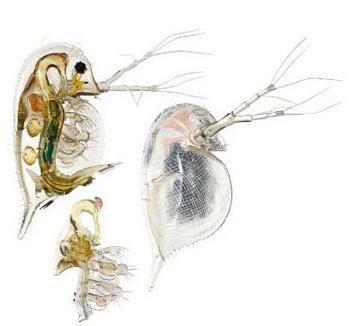 Daphnia pulex - the water flea, female animal with summer eggs, illustration ratio 200:1, in ‘SOMSO-Plast’. This 35 cm tall transparent model shows, apart from typical characteristics such as rowing-antennae, two-leaf shell and turgor-legs, many structural details. The right side separates into the following parts: right shell half with second antenna, part of the right half of the body with the 5 turgor-legs as well as the median sectioned front third of the digestive tract; median sectioned two thirds at the back of the digestive tract, right ovary and two embryos. The model separates into 6 parts. On a stand with base. H50 cm, W42.5 cm, D35 cm, Wt 2.5 kg.